Savana Review 2019: Is Savana a Good Hosting? Web hosting provider Savana was founded in 2009. It offers shared web hosting, managed VPS solutions, and domain registration services to customers of all sizes in the Czech Republic and elsewhere. Czech hosting provider Savana was established in 2009. Its hosting-related solutions include managed and VPS hosting, domain registration, and shared web hosting services. The company targets businesses of all sizes, not only in the Czech Republic but also in other countries including Slovakia, Spain, Turkey, and the United Kingdom. The Savana website is user-friendly and easy to navigate. Everything is visible and easily accessible from the home page, and the provided information is detailed enough for you to make a decision about the offered hosting services. Savana’s servers are housed in modern Tier IV data centers located in the Czech Republic and equipped with four independent, redundant power sources. This vendor has put tight security measures in place along with fire and air conditioning systems, providing the ideal conditions for its servers to secure optimal performance. Savana’s shared hosting starter package, called Savana 101, comes with 10 GB SSD storage space, 5 GB email space, 1 GB space for databases, plus unlimited parked domains and subdomains. The Savana 201 premium shared hosting package comes with 20 GB SSD storage space, 10 GB email space, 2 GB database space, plus unlimited parked domains and subdomains. All hosting services include automatic backups using FTP and FTPS protocols. Savana’s hosting plans are reasonably priced in Czech koruna and are offered on a single monthly billing cycle. The 30-day money-back guarantee should give you sufficient confidence to sign up with this hosting supplier, as should the 99.9% uptime guarantee backed by a compensation plan that pays out if availability falls below 99.6%. You can contact Savana’s 24/7 support team via telephone, email, or live chat, but they have no support ticket system. The team responds rapidly, as I found out firsthand when I sent them a support email and received a reply less than 12 hours later. This vendor also offers remote support and has a detailed knowledge base on its website. For companies looking to have their websites hosted on SSD storage, Savana seems like a sensible choice. 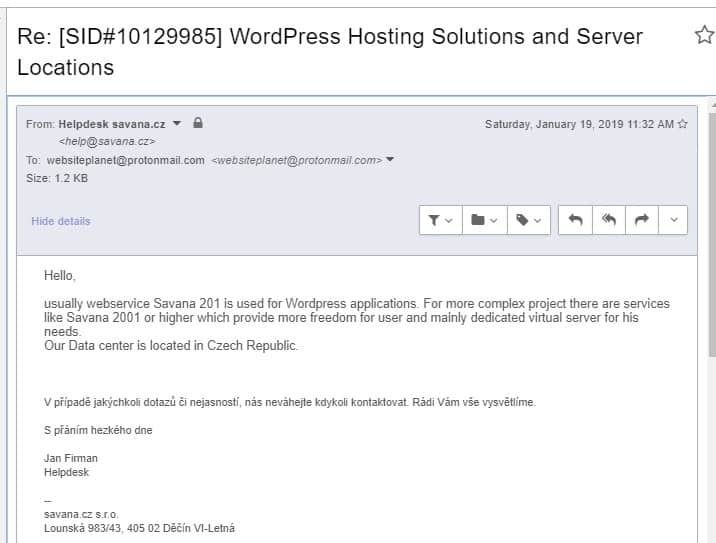 This vendor has the necessary expertise and hosting architecture to deliver excellent hosting services to businesses of all sizes in the Czech Republic and beyond. Wondering how Savana stacks up against other Web Hosting companies? Enter any other Web Hosting company and we will give you a side-by-side comparison.